The countdown to the festive season is on and if you’re anything like us, you’ll be filled with delight at the thought of choosing Christmas home décor that’ll create a welcoming, festive and truly luxurious look from top to bottom. Whether you’re searching for ideas for dressing the hallway, creating attractive table settings, or putting an elegant Christmas tree at the heart of your home, check out these Christmas room ideas. Oh, and don’t forget to have a little fun by evoking a magical atmosphere in kids’ rooms, too. Nothing beats a real Christmas tree when it comes to dressing your home for Christmas. The fragrance is wonderful – especially in a space warmed by a fire – and it will conjure up the right mood as soon as you step into the room. For the most luxurious of looks, metallic baubles are a must-have: we like the gold versions on this tree. They repeat the highlights introduced by the floor lamp and table legs, making the tree part of the overall scheme in the room. It’s equally easy to team tree decorations with copper, brass or chrome tones elsewhere for the same pulled-together effect. For a sophisticated finish, add a second colourway to the tree, and finish it with a pretty topper. Dressing the branches with ribbons can add detail without going over the top, while warm white lights are a better option than multi-coloured strings. Lucky enough to have a real fire or even just a mantelpiece? Don’t miss the opportunity to swap your usual display for a more seasonal version. Rows of pretty tea lights will cast a soft glow, or mix different candleholders to make an attractive grouping. If you choose the same colour candles, the effect’s harmonious. Mirrors behind the mantel will reflect candlelight to boost the display. 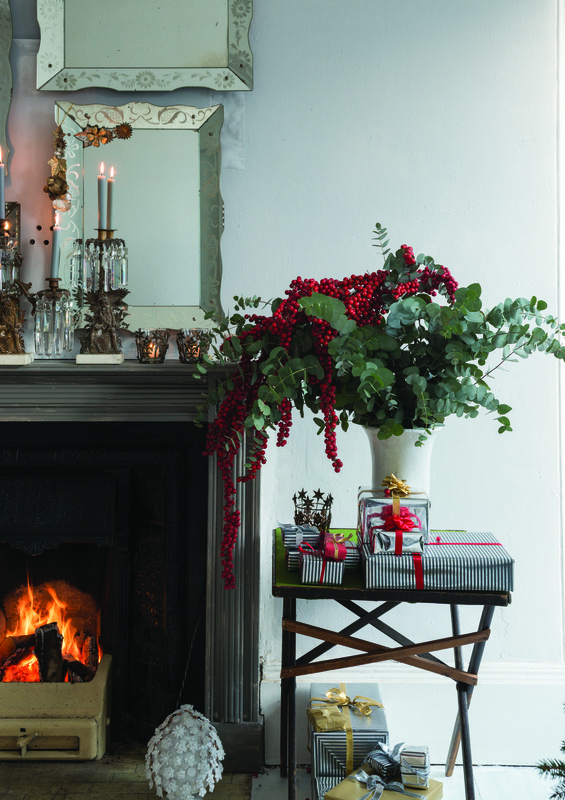 It’s also worth treating yourself to fresh foliage and berries for the mantel or to display alongside. A word to the wise: be appropriately cautious with candles and foliage. Stick to the mantra less is more for the Christmas dining table to keep the look chic. 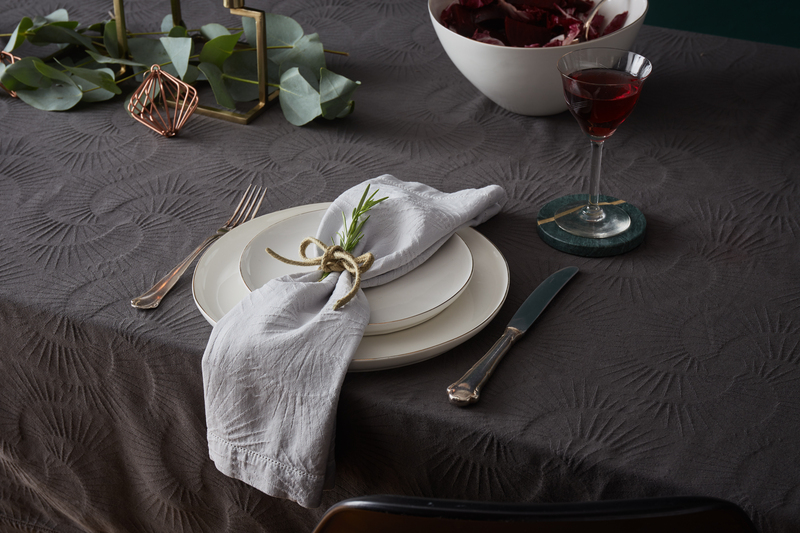 A dark tablecloth will give it a dressed-up look that has a more modern edge than white, while a table centre can make meals feel special whether they’re on the day itself or you’re entertaining in the run up. A modern candelabra, a little foliage, or a few shapely baubles, or a grouping of these elements, looks smart. Make each setting special without going starchy by tying a sprig of foliage to a napkin with simple twine or use an understated napkin ring. Layer plates, and if you can, opt for those with a metallic detail that matches the colour on your tree so your festive look is harmonious from room to room. Be careful not to overcrowd the table when you’re setting it. Put friends and family at their ease with an uncluttered tabletop. Strike the Christmas mood from the entrance to your home with a wreath on the front door. Fresh designs look spectacular but there are sophisticated lasting wreaths on offer, too. Whichever you go for, consider a design that includes blooms or elements that complement the colours you’ve used on the tree. 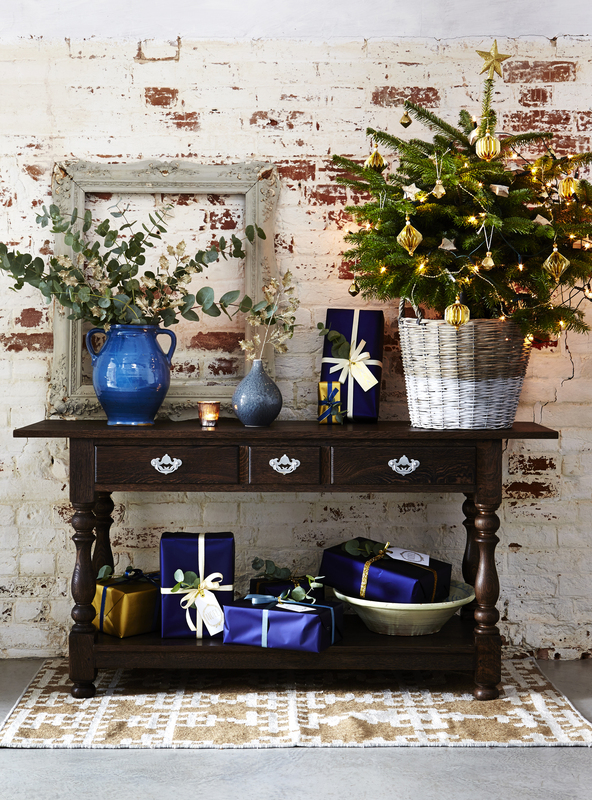 Inside the house, swap the usual display on a console or hall table for a seasonal version. A small tree will fragrance the hall and can be decorated to tone with the larger one in the living room. Vases of foliage look elegant here in addition, or as an alternative if space is limited. A garland on the staircase can look beautiful, too, as well as helping to draw the eye further into the house. Extending Christmas décor to kids’ rooms should prove a hit. Now’s the time to swap to a more traditional palette of seasonal colours, motifs and decorations: red and white, reindeer, Father Christmas, Christmas puds, bunting and advent calendars… If you want to go to town, a mini tree will look cute in here as well.